Learn how I set up a Raspberry Pi (Model B then B+) as the SheevaPlug's successor. ~1.6W consumption typical, 400x less than my original server rack! The Raspbery Pi B/B+ took over from my SheevaPlug and was my main Internet server for a couple of years, until I broke it. A good piece of kit with excellent community support! Having bought a "Raspberry Pi Kit" (R45PI) aka RPi from Maplin, on 2014/06/22 I attempted to get it set up and working with the family TV. (Using the HDMI lead worked just fine.) The keyboard was broken (keys not responding or were sticking) but my local Maplin exchanged it the same day. It booted happily once the keyboard was sorted, and after changing the password, I briefly had my daughter try out "Scratch" which she'd used at school, running under X windows as started with startx. I also got the official Oracle Java JDK7 with an sudo apt-get install oracle-java7-jdk. This is not the smaller-footprint 'embedded' version that I'm running on the SheevaPlug, but at least it should not require funny licensing arrangements. At the comfort of my own desk, and powering the RPi from my off-grid system, I used apt-get to fetch a few more favourite packages such as tcpdump and tcsh. I won't leave the RPi connected all the time until I have spent some time securing/hardening it, though an initial inspection of the output of netstat -n does not suggest too much insecure junk is running, thankfully. (Done) I am expecting get a 128GB SD card for this unit so that I can move all my data on to it and do without the external thumb-drive that I need on the SheevaPlug saving complexity and power. I'll probably stick with Raspbian. I'll use the GPIO UART lines to talk to an OpenTRV unit if possible to avoid the need for an FTDI cable and the wakeup-hungry RXTX library. (Done) I'll possibly use the GPIO and some SPI ADC to replace the current k8055 to reduce power consumption, though I'll measure to see what works best. If the k8055 continues to work with the RPi then I may stick with it even though lots of details of the scripts will probably change. (Done) I'll want to turn off swap or at least reduce the system's desire to swap (since swapping will kill the SD card and make servers unresponsive) or maybe use something like zram instead. (Done) I'll enable iptables to kill some dangerous traffic early, as for the SheevaPlug. (Done) I'll want to transfer the various HTTP/SMTP/DNS/NTP/etc services across, though I can run them in many cases as 'secondaries' first to ensure that RPi performance is adequate as for example is a slower clock than the SheevaPlug. (Done) Adjust logging and other apps to minimise disc write traffic as per SheevaPlug (though already good out of the box), and enable full log rotation. (Done) Use /proc/sys/vm/block_dump to check sources of file write traffic. (Done) Set the system timezone to UTC (easy using raspi-config). The RTC Pi RTC arrived very promptly! I fitted the RTC board with a battery and then plugged it into the RPi. Steady-state power consumption after boot is still 3.2W. (the SPI driver blacklisting is already commented out). which shows the address '68' which is promising. which shows that the kernel can see the clock but it is not set yet. Time elapsed since reference time has been 0.394304 seconds. It might be better to get this done earlier in the boot sequence, eg before logging starts. and after a short while power consumption drops to 1.0W. which should ensure once per day that the RTC time is forced to be correct. A DS3231 may be a good drop-in replacement for the DS1307 running directly at 3V3 and so not needing level converters for a start, and working with the same software drivers... Also look at DS1338 and DS1337. apparently drops it back to 3.2W! The consumption claimed by the mains monitor is not always linearly related to that measured by my bench supply, and the bench supply is likely to be more accurate for a number of reasons. Various sources on-line suggest that replacing the 3V3 on-board linear regulator which actually supplies most of the board power (5V is for USB mainly) might save 25%+ consumption, maybe as much as 1W, though the USB and Ethernet alone are actually heavy users at ~0.5W and the only power control in software affects both at once. Replacing the the 3V3 linear regulator with a RECOM R-783.3-0.5 is reported to save ~15%. but even after a reboot and with the CPU nominally running at 100MHz I'm still seeing 3.2W consumption! to minimise GPU memory allocation since I shall be running headless. I see consumption apparently drop to 3.0W! I have ordered a couple of ~80% efficient 3V3 switching regulators and a spare Model B board (and 128GB SD card!) to experiment with, eg replacing the reg and testing other energy-saving mods. Attempting to get a more accurate power measurement by using my bench supply connected (naughtily) to the appropriate GPIO pins at 5V, shows an idle consumption of 380mA or 1.9W (logged in over ssh), rising to 420mA (2.1W) with a CPU-busy loop (while true; do true; done as above). Compared to the 3.2W reported by the mains power monitor this suggests a mains adaptor efficiency of ~60% at this load. Running a large "find" raised consumption to 440mA (2.2W). After halting, consumption dropped to 110mA (0.55W). # DHD20140628: further tweaks to reduce SD card traffic. I am using some prime timings to hope to decouple different activities. I also adjusted /etc/logrotate.conf to by default compress logs. I also turned off debug logging. in /etc/pam.d/common-session-noninteractive may also help reduce unwanted chatter/writes. 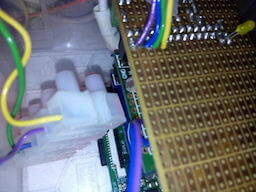 Note also a simple debugging/monitoring aid in the 'ACT' LED on the RPi board. will have the LED come on with CPU activity for example! turns it off saving a tiny bit of juice, presumably! The llctl code can be used to (for example) turn off the LAN "100" and "FDX" lights which don't convey a huge amount of information, or use them for other purposes. leaves the "LNK" LED flickering on activity and turns off "100" and "FDX". current draw drops to 350mA (1.75W). # Power down the TV output after a while to save 100mW after warning users. # Happens after a delay to allow system recovery using TV/keyboard. # Not done if anyone appears to be logged in. # COMMENT OUT THE FOLLOWING LINE TO KEEP THE TV OUTPUT RUNNING. This waits three minutes and if no one appears to be logged in sends a warning and then after a further two minutes and turns off TV service, saving 100mW. If someone does appear to be logged in then the TV service is left on, with a warning to turn it off manually. Thus, a few minutes after a normal unattended boot TV service will be turned off and the extra power savings will be taken. As a practice run if nothing else I'm taking a backup of the 4GB SD card with the work done on it so far. Having halted the RPi and removed the SD card, I can plug the SD card directly into the SD slot of my MacBock Air (running 10.9.3) and the leading FAT partition is mounted automatically. before physically removing the SD card from the Mac. I have copied the RPi.img file to 20140627-RPi.img and compressed it with the best-available tool easily available on my Mac to save space, bzip2, since most of the file space is not even used. I will then try cloning that to another 4GB SD card and see if I can boot and run the RPi with that, then to an 8GB card, expanding the partition or creating a new one for data beyond it, then repeat the exercise with the new 128GB card that I have just received. With the destination class 4 card (x150) dd took about 3 minutes. Success! The RPi boots off the clone card all working as before! Power consumption is apparently as before also. I am now attempting to dd the 4GB image onto an 8GB card, to see if it bootable and if I can create a new (ext4?) partition beyond the existing ones as data space. The RPi boots happily from the 8GB card with the 4GB image on it, and with power consumption unchanged. Thus creating a new partition filling all the trailing free space. which suggests that this is not particularly laid out to minimise wear and increase write performance. This should give me the ability to back up the OS separately from bulk data, by cloning only the leading part of the SD card if I am feeling brave, for example. It should also help me move data from the SheevaPlug to the RPi later in the transition between them. Use parted to create a new partition using all the free space. Use mkfs to make the new partition (then add to fstab). Add new partition/line to fstab with sensible mount options. I rebooted to check that all the appropriate changes 'stuck' including the new mount options. All seemed well. Done: backup taken of RPi card as of this morning, and 128GB card cloned to and with new huge data partition! I have re-enabled the fake-hwclock so that log files written doing boot have more sensible timestamps! I have ordered an ABElectronics ADC-DAC Pi with two analogue input channels to enable me to monitor battery levels as I do now using the k8055. (I may not use the outputs at all.) Hat-tip for excellent customer service, by the way! In preparation I downloaded one of their sample code files, compiled with with the gcc C compiler already present on the RPi. I ran it for sheer devilment even though the hardware is not yet here! which indicates well under 1ms per sample/reading, and that missing results in a 'safe' zero reading rather than (say) a hang. A very small amount of code should be able to capture the two voltages and make them available to a script just like the k8055 script, though I may take the opportunity to radically revise how that works. Given that gcc is "built-in" and that running the power management and stats code quickly saves energy, it might indeed be better to move the bulk of the logic into the C code itself. Certainly some of the arithmetic and logical operations would be clearer, and orders of magnitude faster! One possible disadvantage of this MCP3202-based circuit is that it measures relative to the supply voltage which might easily wobble +/-10% without harm. Whereas I need to measure typically a 0.1V change in ~12V, or <1%. So I may have to switch to a different ADC card with a built-in reference. Though even there, noise/drops in the ground connection would impact accuracy. These make banning a little more aggressive than usual. Trimming logging output too much may inhibit fail2ban. # Accept anything on loopback. # Handle normal inbound traffic not otherwise dealt with so far. to drop any unexpected traffic, ie to ports other than we might wish to answer. to start iptables before bringing the (wired) network up. I'm starting to test out some of the major components that will need to be shifted from the SheevaPlug, plus many many packages from gnuplot and optipng and svn through to some of my primary Java applications. I notice that Java is running at about 2/3rds the speed on the SheevaPlug, which would make sense just comparing clock rates, so I could have some of that back if necessary by overclocking. A small Java application that (re)computes GB grid carbon intensity, updates some Web pages and flag files, and posts to Twitter, works just fine. User time up from about 4s to 6s. My largest Java application from the SheevaPlug, my Tomcat-hosted WAR, is pretty slow to start up but is possibly more efficient with memory than before (possibly because of latest JDK vs 'embedded' Java 7). But the point is that things are working as I copy them across to try out. To try to improve start-up time I'm trying 'modest' overclocking (to 800MHz, all other clocks and voltages unchanged) set by raspi-config and I have initial_turbo set to try to get to the cpufreq governor quickly! 700MHz is the default ARM clock speed (arm_freq). # Mild overclocking for when we need it. Time to boot measured from power being supplied to the board up to when all the LAN LEDs are turned off (in rc.local) and ssh login is possible is ~105s (and a little under 20m to settle down into a reasonably steady state) including the large Java Web app starting up. At least the is no longer a PermGen in 8, which saves one config headache! fail2ban seems to take enough MB of virtual (~27MB) and resident (~6MB) memory that I may turn it off again or run it intermittently. Although it makes me feel good about detecting ssh attackers I'm not sure that it's actually protecting me from much, and it's preventing me turning down logging in the auth.log also! I'll decide when I start bringing up other services that need (virtual) memory. This may also adjust environment and command-line space. See also Tweaking stack size of Linux processes to reduce swapping. However, as it doesn't seem to work I'll skip that solution! 0 upgraded, 0 newly installed, 3 to remove and 4 not upgraded. which is much better! But fail2ban may still get disabled, and Apache et al may still need individual ulimit treatment when set up. I have built a very simple 'shield' for the RPi with some matrix board and a suitable socket stacks on top of the RTC board. On that shield I currently have currently placed a pair of screw terminals connected to GND and to GPIO25 (via a 100&ohm; resistor for a tiny degree of protection, eg against inductance) and an LED via a 4k7 resistor to GPIO25 also so I can see when the line is on. # Turn on/off the desk light (on GPIO25). # If $1 is not "on" then turn it off. # Set up GPIO if required. I have wired up a 3.5A/24VDC 3V-input SSR (Solid State Relay), part CN024D05 ie RS720-3940, with its input from GPIO25 (via a longish cable run to its own box) and output in series with a nominal 4.5W 12V MR16 LED (and back-EMF fast protection diode) powered at 12V from my off-grid system, and I now have a software-controlled solar-powered desk light! Note that I did not common the grounds, ie the signal and power are separate, which avoids setting up any ground loops or unwanted flows through the RPi. which provides a /dev/hwrng binary readable device, which amongst other things I will use with my EntropyPool Web service in due course. With /dev/urandom all users will likely be able to run it, and not block. to reduce rngd's use of virtual memory from ~6MB to ~3MB. To use ABElectronics' ADC Pi Version 2.x I first have to change its i2c address not to clash with the RTC at 0x68, so I've chosen the 0x6A/0x6B configuration from their datasheet. This board is based on the MCP3424. in /etc/rc.local to tell the system that the devices are present, and then maybe C or C++ or Python or i2cget and i2cset from the shell to read and write it. which confirms the new devices visible at 0x6a and 0x6b. shows the devices at 0x68 and 0x6b. Does a one-shot maximum-speed conversion of the input on channel 4 of the ADC on 0x6b, ie channel 8 of the board, and returns the top nybble of the result, eg values ranging from 0x00 to 0x07 at my desktop at the moment by drawing the curtains or opening them. I could probably skip the sleep given the conversion speed! I can get the next 8 bits with i2cget -y 1 0x6b 0 w but the extra data is at this stage probably not needed for, for example, a crude day/night sensor. See the power management C++ code, intended to be run periodically (ie every few minutes) from crontab, and which contains i2C support for the LDR amongst other things. Note that ADC1 (channels 1--4) and ADC2 (channels 5--8) can be read in parallel if required, doubling throughput. BATT1 1328 raw = 12.48V direct to local busbar (calc 12.46V). BATT2 1359 raw = 12.77V direct to local busbar (calc 12.75V). Note that these measured voltages are ~0.6V lower than measured at the k8055, (13.0V and 13.4V) which suggests possibly at least that much voltage drop in just the +ve side of the wiring segment from the service cupboard downstairs to the desk busbar, which would be a bit sad, and a motivator to move equipment (eg WiFi and RPi) down to the service cupboard, eliminating that segment for most uses. Measuring at the Li battery (Batt2) in the with the DMM gives 13.00V, and measuring at the same junction board for Batt1 gives 12.50V, which suggests that possibly the wiring is OK and the k8055/SheevaPlug is miscalibrated, and that I've been beating my batteries up more than is wise! 2014/07/11 I have bought a number of high-side current measuring devices to play with, including the digital I2C-based Adafruit INA219 Current Sensor Breakout via oomlout with the aim of continuously and accurately monitoring power draw from the 12V nominal off-grid solar PV battery stores, for normal logging and at a higher rate for performance/consumption tuning. I may have to remove the on-board SCL/SDA 10k&ohm; pull-up resistors to avoid overloading the i2c bus (there are other pull-ups already). Seeing how close the shunt inputs are to low-voltage parts of the board is making me nervous. A small slip/short could toast my RPi and everything connected, which would be particularly tiresome if the SD card was destroyed. Hmm, will have a careful think! The first two are ~2.5W, and the last two are ~4.3W with the CPU busy. Note that when this measurement was taken all USB devices had been unplugged, so this represents consumption by the SheevaPlug itself. INA initial read 39 9f. INA bus voltage read 61 c2 = 12384. INA shunt voltage read  7 f3 = 0.020350V. INA current read  f e6 = 0.203500A. INA power read  9 f2 = 2546mW. ie that the voltage into the 5V regulator is 12.4V and the current 204mA. 2014/07/11: NTP: the NTP configuration was updated with some of the features from the SheevaPlug to be more suitable for the free public service that ntp.exnet.com provides, and the two main DNS aliases were moved across in stages to the RPi. All seems satisfactory. Even without being part of one of the NTP pools (which has proven too burdensome in the past in CPU and bandwidth terms, I think), it is clear that the NTP service is still supporting several hundred clients. Gallery/PG2K: moved the PG2K master from SheevaPlug to RPi, copying the data from the USB thumbdrive on to the RPi SD card, then (on 2014/07/12) changing the DNS entry (with TTL of ~1d) then bringing down the old master, capturing some logs and config and history, bringing up the new master with the history, and prodding one of the mirrors to connect immediately to the new master (others will need DNS timeouts). random.hd.org: his was a good moment to move the co-located random.hd.org across also, updating DNS and Tomcat appropriately, and random.hd.org's own config to make use of the new hardware RNG support and local environmental data. because Tomcat already has one of the addresses bound. Editing /etc/apache2/ports.conf to listen on appropriate addresses allows Apache to start. There will be plenty of tuning and tweaking to come, starting with some ulimit magic (in envvars) to reduce stack space, and cutting the number of servers/threads/runners to fit this small box! 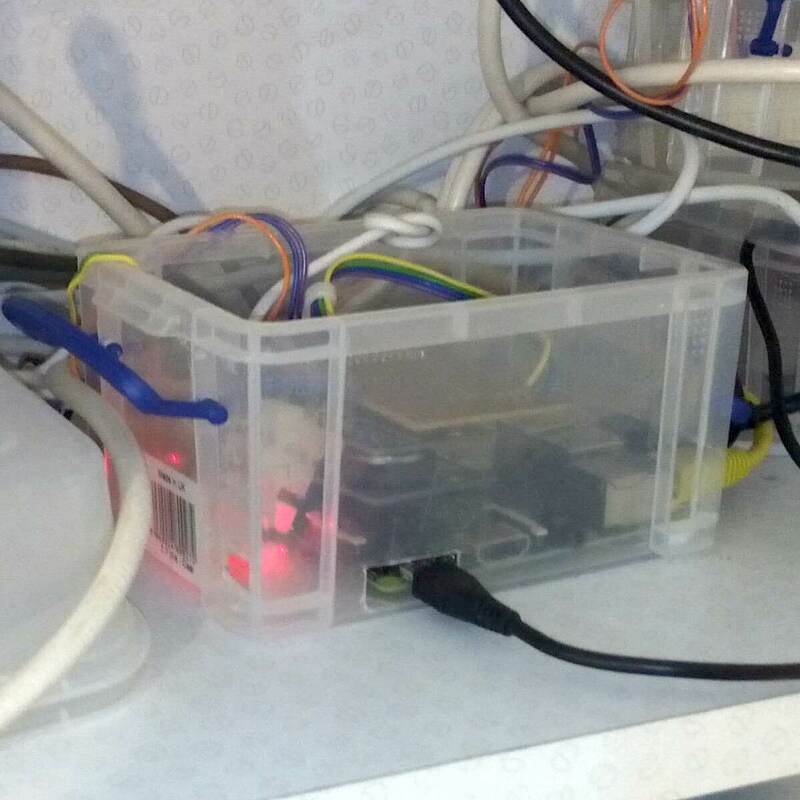 2014/07/14: displaying the Off-Grid Power page again, this time with added live power consumption and local 12V bus volts, albeit SheevaPlug power draw initially rather than the RPi. A small experiment indicates that plugging in the SunnyBeam via a 2-way USB hub bumps up consumption by ~1W, thought it is possible that the SunnyBeam battery is charging. Missing out the hub seems to only cause an additional draw of ~200mW, in line with what was observed before. Time to get sendmail set up. Always a fun one. It's removed exim (which I installed just to get lockfile, it's creating keys and all sorts of exciting stuff, and it's inviting me to run sendmailconfig later. I will deliver mail to sendmail by tunnelling over SSH as in the old days, as I know how to do it and it's safe. but I trimmed the offending trailing lines from sendmail.mc anyway without apparent bad results. I'm also going to set up a simple secure POP3 daemon, rather than tunnelling a session over SSH. Direct secure access will need a slightly more open firewall and a greater attack surface. and I've enabled the dovecot and sasl jails for fail2ban as a precaution. Dovecot has rather intimidating configuration (and I'm used to sendmail's!). First up is to drastically trim its resource limits for the RPi and more or less my sole usage in /etc/dovecot/conf.d/10-master.conf and enable just pop3s. Some tweaking of current usage was necessary, including extra care on file permissions and ownership since the daemon is now running as the user 'bind'. OpenTRV stats monitor done: 2014/08/11. As of late evening 2014/07/16 (22:30BST) the SheevaPlug is shutdown and disconnected, and the RPi is providing all services. Boot-up power for the RPi is ~2.7W vs the 2.5W--4.4W draw of the SheevaPlug (without k8055 or USB hub(s)). About 30m after boot (some services take a long time to fully start) power draw is ~2.3W and the RPi is handling 30 network packets per second. Note that random misuse of (attacks on) exposed public services such as ssh were pushing up system load and power consumption. A bit of tweaking of sshd against attacks (such options as MaxStartups and AllowUsers) kept down load directly and made it possible for fail2ban to notice the attack and shut out the IP addresses automatically with a noticeable drop in load! Interestingly the overhead of the cron job to run the powermng sampling including power, adds ~200mW to the apparent load! Putting a 5s sleep ahead of the power measurement then logs a correct ~2.3W typical load. I now have a RPi Model B+ and an 8GB microSD card. I'm trying to dd the 4GB image saved above onto the 8GB card (using my Mac) to see if the B+ will boot off it (though I don't actually have keyboard or screen easily to hand at this moment) and what power consumption is. There is a slight risk that the image will not be suitable, and/or that the tweak that I use to turn off the LAN LEDs to save 50mW (not even immediately obvious on the B+ board) may damage something. A Model B board (no USB or video or Ethernet connection), after being given a couple of minutes to get through boot, runs at ~2.5W reported drawn by my mains power supply. The equivalent B+ steady draw, assuming that it booted correctly, is ~1.5W. That probably corresponds to ~1W drawn by the board itself, and an mains adaptor efficiency of ~60%. because it turns out that the new card is slightly smaller than the old, thus truncating the last/data partition. So I logged on on TV console, removed the last partition with fdisk (parted just whined and stupidly refused to let me do anything at all), recreated the final partition, put in an ext4 filesystem again with previous parameters, mounted under /lmnt, mounted the old SD on USB and that old partition (/dev/sda3) on /mnt, and prepared to copy the data partition over. I tried doing cp -a /mnt/* /lmnt but it seemed to hang, so instead I did an rsync, which worked, and took about 8h. Note that the llctl program still seems to work. Though I can only see two of the three LEDs (moved to the network socket). And indeed of my three stacked GPIO cards (RTC, ADC and my own hand-crafted) all worked exactly as before. Well done RPi Foundation on backwards compatibility! Power consumption seems to be down to ~1.5W once everything is at steady state, so a reduction of ~0.8W/~30%. (Note that the power figure includes any losses in the 12V-to-5V PT78HT205V 10W, 5V, 2A switching regulator, and any USB devices plugged in.) Max (stress) consumptions of the various RPi models are reported as Pi1B+/Pi2B/Pi3B 0.35A/0.82A/1.34A circa 2016. The SunnyBoy monitor permanently plugged into USB to allow continuous monitoring draws ~100mW, in part apparently because it doesn't turn its graphics off, so a USB power-down arrangement might avoid some or all of that, especially at night and in winter when readings are not useful for many hours. 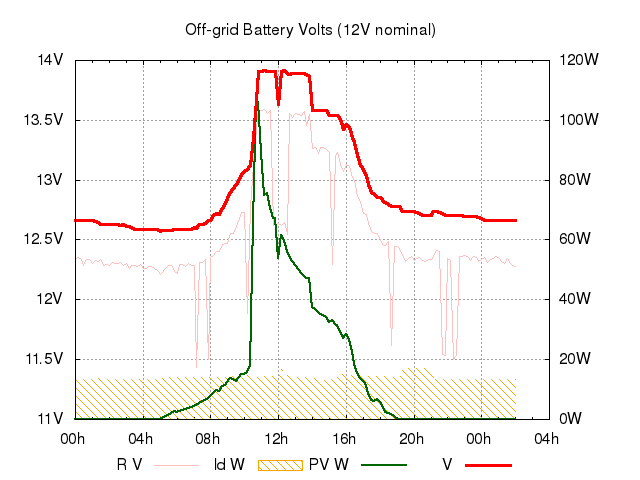 It's not yet clear how much the RXTX library hurts power consumption; at several hundred (unnecessary) wakeups per second the effect was significant for the SheevaPlug and MacBook Air. Initial observations suggest another 100mW--200mW, possibly from stopping the CPU sleeping properly as expected. to switch back to a negotiated (100Mbps duplex) rate, and if there was any difference at all it was minor and 10Mbps was higher power. 2015/05/15: an apt-get update then dist-upgrade brought me into the wonderful world of device tree, signalled by the fact that I no longer open the i2c device that I'd been using. Consider adjusting /etc/default/tmpfs so that everything under /run is one tmpfs, and /tmp is also a tmpfs, possibly with reduced max size, partly to reduce SD card traffic and partly to reduce kernel/VMEM use. 2014/06/17: Raspberry Pi (B) kit from Maplin seems to draw <3W with just SD card in and after booting likely finished, so less than the SheevaPlug! Note also low-power tips including advanced items such as replacing the 3V3 reg with an external switching unit. Also see Jeff Geerling's Pi0 power page. Ability to use 128GB SD card means that it may be possible to do without external Flash drive for Gallery data for simplicity, and GPIO may be able to directly monitor battery voltages, control external power relay and even talk to (say) AVR serial, saving all sorts of external power drain. ZRam is nominally available in Raspbian (though seemed to have been removed from the version I have). Possible AbioCard combined RTC and ADC / GPIO card (and case!). Setting up RTC with DS1307 for RPi generic instructions. Useful summary of how to get RPi system information at the command line such as core voltage and frequency. The Pi4J library may be handy for I/O. Some good security stuff on fail2ban, and iptables in Part II. Using RTC earlier in boot than rc.local allows. Shell-level access to GPIO using /sys/class/gpio/export; also see RPi Low-level peripherals. Example 'llctl' code to manipulate (including turning off to save 10mA) the LAN status LEDs. Finding for Debian packages containing particular content, such as lockfile which should be very handy! PPPS (Per-Port Power Switching) for USB. OpenTRV local monitor script to connect to REV1/REV2 unit over serial. Setting up RPi, owfs and DS9490R to read OneWire buttons. First published 2014-06-22 , updated 2019-04-22 . Site copyright © 2007-2019 Damon Hart-Davis. Hosted by ExNet.